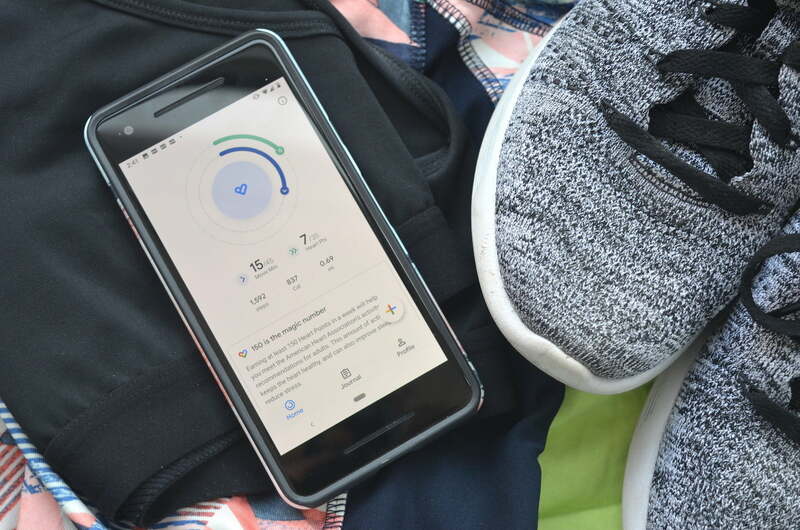 You could have earned a Bachelor’s degree in the time it took Google to deliver a significant update to its Fit app. Well, it’s finally here, and the update doesn’t just bring a slick redesign, but it makes fitness tracking far less overwhelming. We’ve been testing the new Google Fit out. Here are our recommendations on how to get the most out of the app, and our general impressions. 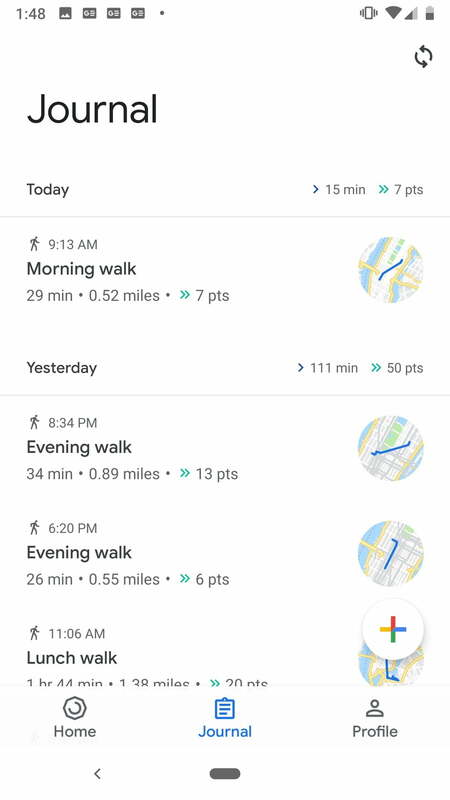 The new Google Fit app has received the all-white Material treatment like many other Google services. Gone are the bright colors and cartoon graphics — instead, there’s a clean, white background with blue and green accents to highlight items of importance; it’s all business, and no fun. 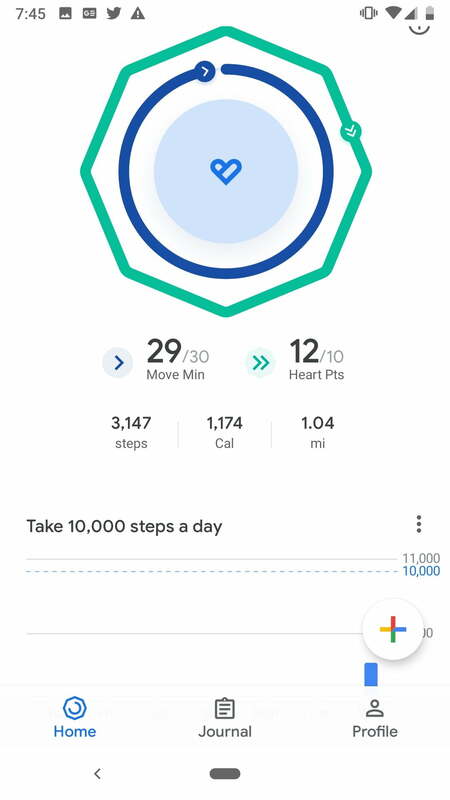 The most important section of the app is the two grouped rings on the homepage; Google’s taking a page out of Apple Health with these activity rings — the blue, inner ring tracks Move Minutes, and the green, outer ring measures Heart Points (we’ll get to them soon). You still have quick access to step count, calories burned, and distance walked right below. Further down, there’s a chart that shows step count data over the last seven days. It defaults to a goal of 10,000 steps a day, but you can edit it to include more or less. Scroll towards the bottom and you’ll see heart rate data — though a Wear OS smartwatch is needed, or you will need to port your heart rate from a device that is capable of syncing with Google Fit. Below, you can also track your weight, but it needs to be manually inputted by tapping the floating “+” icon. Tap on Weight yo see how your weight data fluctuates over the course of a year, if you’re proactive about logging it. One noticeable omission over the previous version of Google Fit is the widget. There are two other tabs accessible on the bottom. The Journal tab shows a history of your past activity, whether it’s a morning walk or an evening run. The Profile tab is where you can edit your personal information like gender, weight, birthday and height. It also allows you to increase or decrease your activity goals. On any tab, the “+” sign in the bottom right-hand corner lets you input activity data as well as weight, activity, and blood pressure. It’s here that you can also trigger tracking a workout, and there’s quite a number of exercises to choose from. Unlike the Samsung Health app, there’s no option to measure heart rate simply by placing a finger on the rear sensor of the phone. 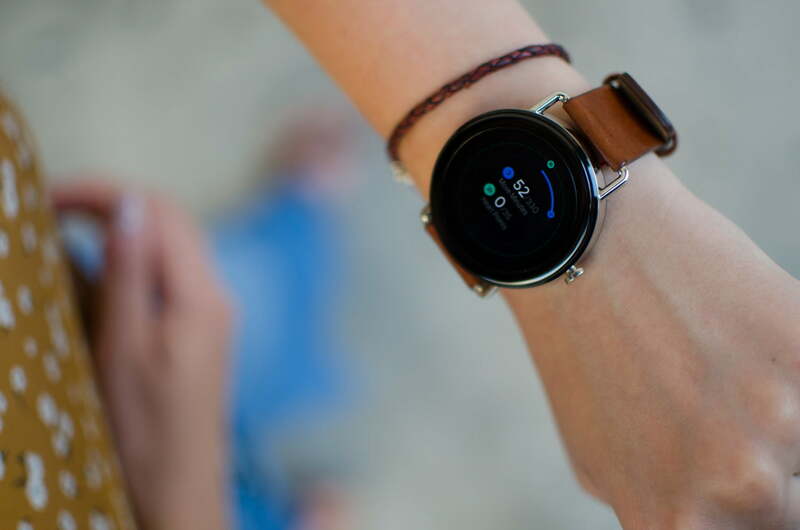 You’ll have to wear a Wear OS smartwatch with a heart rate sensor or a device that can sync with Google Fit to track it on the app. One noticeable omission over the previous version of Google Fit is the widget. 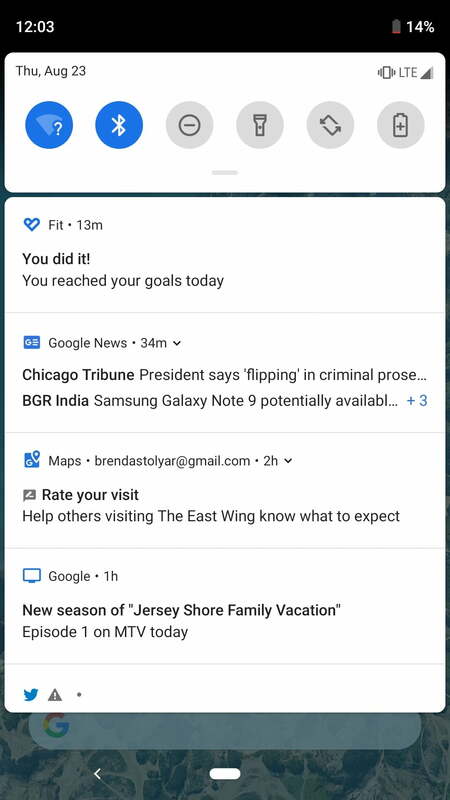 There’s no option to add a widget on your home screen anymore to quickly see activity rings in the new Google Fit, which is disappointing. We’ve asked Google if a widget for the new version is in the works, and have yet to hear back. There are two shortcuts you can add to your home screen, however. Long press the Fit app icon and press and hold Track workout or Add weight to create shortcuts for these on the home screen. 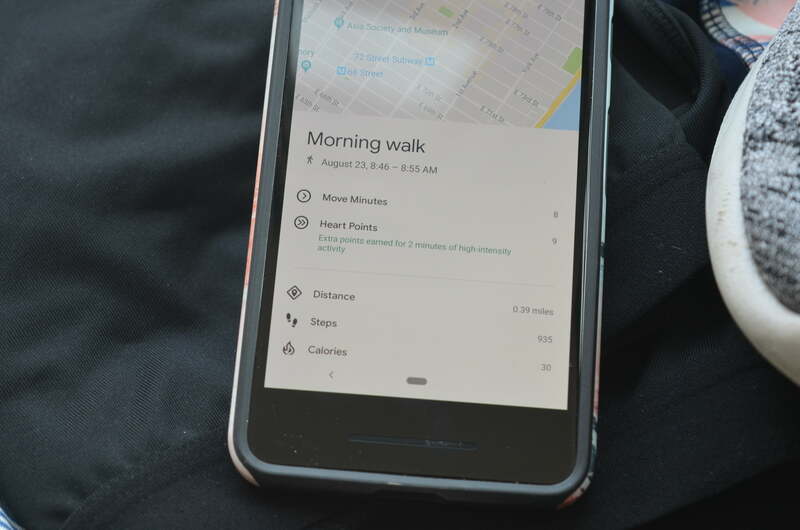 Rather than only tracking activity based on steps, Google has used data from the American Heart Association and the World Health Organization to separate activity tracking into two categories: Move Minutes and Heart Points. Tap the information icon in the upper right-hand corner of the app to see an explanation of how it works, and we’re breaking it down a little further here. Fit counts each minute with 30 or more steps as a Move Minute, and one Heart Point is earned for every minute of a moderately-intense activity — like speed walking — or more than 100 steps per minute. Score at least 150 Heart Points per week and you’ll meet the American Heart Association recommendation of 150 active minutes per week to improve cardiovascular health, which in turn will lower the risk of heart disease and stroke. Divide 150 by seven, and the daily Heart Points goal comes out to be around 21 rather than the lower default. You may be hitting your daily step goal, but that doesn’t mean you’re performing enough physical activity. 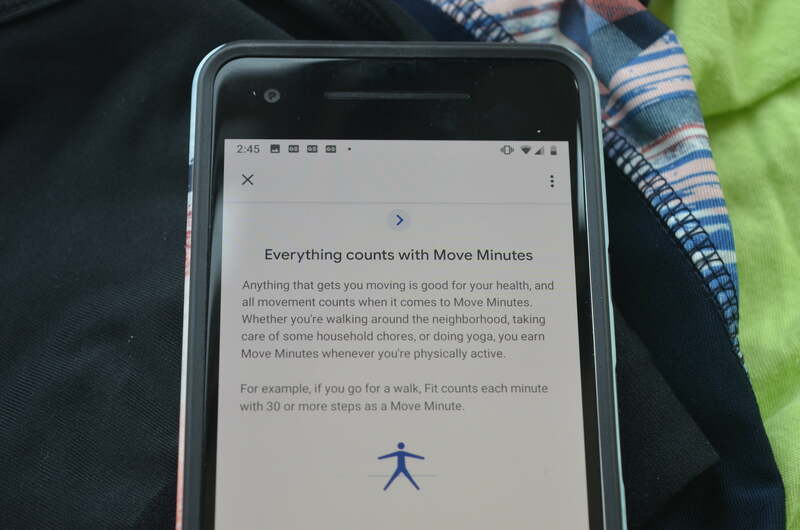 Google Fit doesn’t provide recommendations for Move Minutes, but this is likely because Heart Points are the more important metric to focus on. You may be hitting your daily step goal, but that doesn’t mean you’re performing enough physical activity that gets hearts pumping. Heart Points are a good way to gauge how active you really are in a given day, and the app is designed in such a way that we feel as though we have to hit the goal by the end of the day. Extra points are also awarded when you participate in a high-intensity activity, which definitely motivated us to run for longer periods of time. Move Minutes are there to track day-to-day movement that’s not as intense. 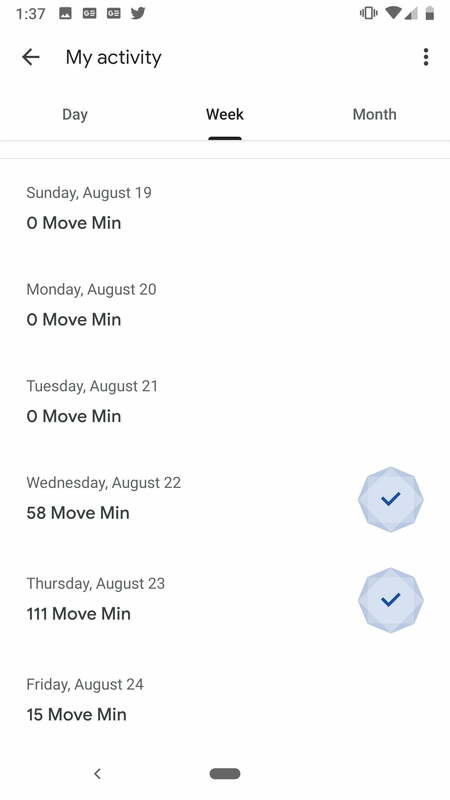 Even when we walked a far distance, Google Fit didn’t capture any Heart Points because we didn’t move quickly enough, but it did track Move Minutes. We recommend setting a high goal — around 330 Move Minutes — instead of the low default, to correlate your 10,000 step goal. 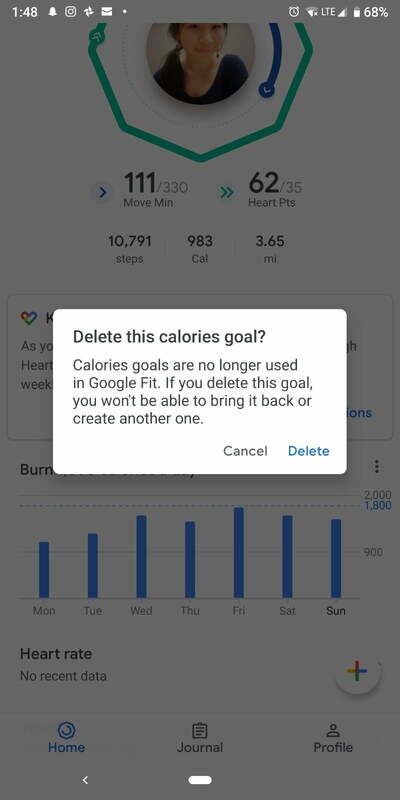 All this being said, it became more clear that Google was putting an emphasis on Heart Points when we realized both steps and calorie goals are being phased out completely. 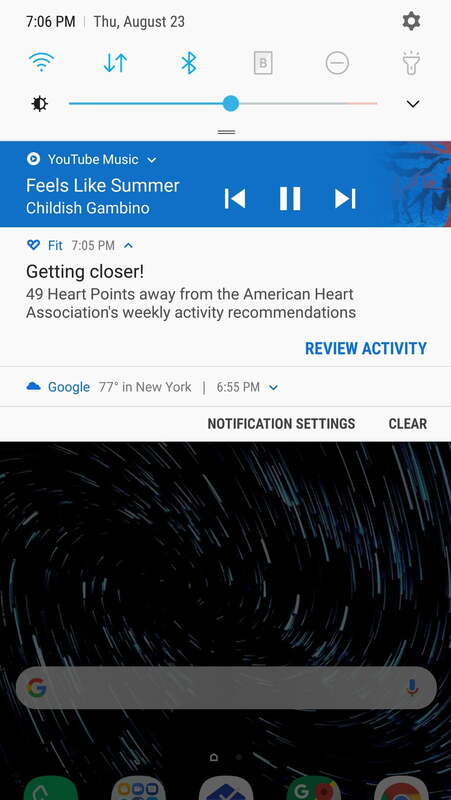 When we tried to edit both, pop-up notifications appeared stating that Google Fit no longer uses the two features. Deleting either one meant getting rid of the metrics from the app completely. It’s unclear if a future update will automatically remove calories and steps from the app, but for now users can still keep it on their profiles to track. You’ll receive notifications to keep going if the app finds you’ve been inactive for some time. 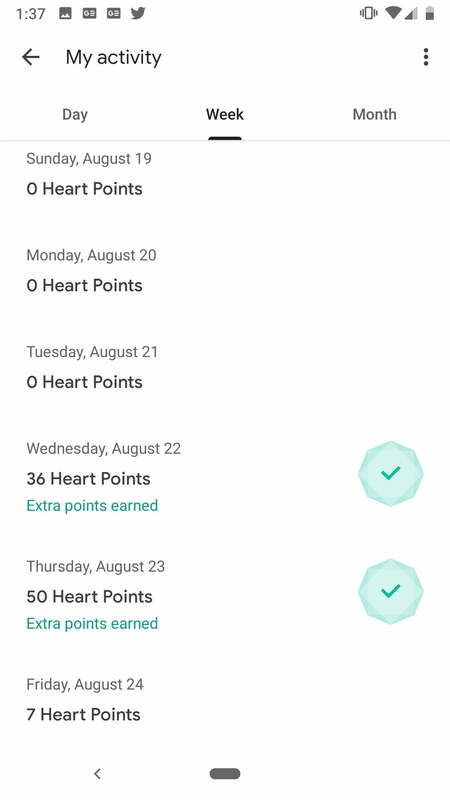 The alert will let you know how many more Heart Points you have to go to reach your weekly goal, and you can then tap on the notification to see a more in-depth view of your activity. You’ll also receive an alert letting you know you’ve reach your goal for the day. We’d argue these notifications could be a little more encouraging or fun, as they’re currently a bit bland, and we also felt as though the app didn’t serve us enough notifications. We don’t want to be inundated, but we’d like a few more reminders to keep us moving. Perhaps a setting to tweak the amount of notifications we want is in order. When you’re ready to workout with Google Fit, tap on the plus sign to begin tracking and then choose the activity you’re doing. The app offers a wide range of activities — from running to hiking and also more specific ones like gardening or meditation. We went for a run with the app, and were able to track time, miles, distance, and calories. It also showed how many Heart Points we were earning in real time. Once done, the workout is added in the Journal section. When you’re not manually tracking your workout, the app can automatically detect whether you’re running, walking, and biking, using the sensors in your phone, which we found to be mostly accurate. There is a chance it might accidentally register car or train rides as a workout, but you can thankfully edit or delete these logs. 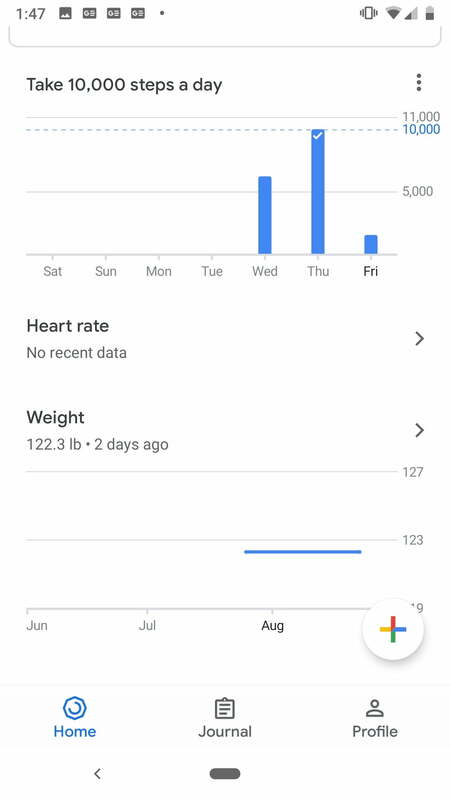 Working out with Google Fit and tracking activity on a daily basis is easy, fluid, and simple, and it’s a much improved experience over the old app. The new layout does away with confusing navigation and unnecessary information, making it less overwhelming and enjoyable to use. It could do with a few more goal-tracking options, as well as an option to receive more notifications. We have yet to use it with a Wear OS smartwatch, but we’ll update this article when we do.